In most mainstream vehicles, the design of the interior naturally follows a "T" shape. The dashboard, usually containing the driver's instrument cluster, air-vents, infotainment system, media and climate controls, stretches horizontally across the width of the car, whilst the centre console extends downwards to separate the driver and front passenger's space. In turn, a manufacturer may use this fundamental interior architecture to contrast the horizontal or vertical axis of the "tee." This is evident in the C-Class above. In this vehicle, Mercedes has developed a 'waterfall' style centre console that uses a single curved plane to flow organically from the horizontal dashboard into a "T" shape, creating a smooth division between the driver and front passenger. This console can also be personalised in numerous trim options, to create a contrast with the horizontal axis of the interior. Above: In addition to the wood veneer, the centre console of the C-Class is also available in piano black and carbon-fibre trims, all acting as a contrast to the interior's dashboard (horizontal axis). In this sense, Mercedes' incorporation of a flowing centre console accentuates the vertical axis of the "T" interior design common to most passenger vehicles. Above: The 2015 Volkswagen Passat interior. Volkswagen's Passat takes a different approach by placing emphasis upon the width of the dashboard rather than the centre console. A uniform horizontal strip runs across the top of the dashboard. By cleverly disguising the air vents, this strip develops a Bauhaus style minimalist allusion of a single air-vent for the entire dashboard, whilst also highlighting the width, and hence spaciousness, of the vehicle. Thus, whilst Volkswagen and Mercedes-Benz place a focus on the horizontal and vertical aspects of their interiors respectively, overall these manufacturers reinforce the inherent "T" design of an interior. Drawing inspiration from Mercedes-Benz, vehicles such as the new Kia Stinger have a similar approach to the C-Class. Above: The interior of the 2018 Kia Stinger. A criticism of both the Stinger and the C-Class' interior design is the placement of the infotainment screen, perched on top of the dashboard akin to an iPad being glued on top of the air-conditioning vents. This placement of the infotainment system detracts from the brands' otherwise sharp focus on maintaining the "tee." Tacking on the infotainment screen to the top of, or in front of, the dashboard interrupts its horizontal flow, and creates a messy, cluttered design that disrupts the inherent "T" shape. Above: A view of the centre console of the C-Class with the infotainment system above the air-vents. Whilst the flowing, 'waterfall' style centre console is elegant, the infotainment screen clutters the dashboard and disrupts the otherwise clean 'tee' architecture established by the centre console. Above: The interior of the 2017 E-Class, a vehicle that is a step up in size from the C-Class. On certain trims, horizontal lines embossed into the panelling further accentuate this horizontal flow. Nevertheless, the retention of a flowing lower centre console, albeit to a lesser extent than the C-Class, develops an overall cohesive and elegant interior design that is balanced between its focus on the horizontal and vertical axes, and is a significant improvement upon the interior of the smaller C-Class. Of course, the infotainment screen can be equally as well integrated into the vertical axis of the 'tee.' It is not necessary for the infotainment display to be confined to the horizontal axis, or dashboard, of the interior in order to maintain a clean, cohesive look. Vehicles such as the McLaren 570S and Volvo S90 are a testament to this. Above top: The interior of the McLaren 570S. Below: The Volvo S90. Whilst the McLaren is geared towards a significantly different market than the other cars described here, it remains relevant when purely considering the design of the interior. Rather than perching the infotainment system on top of the dashboard or the centre console, both the McLaren and Volvo incorporate a portrait-orientation display in line with the vertical centre console, thus maintaining a cohesive look. An exception to the advantages of an integrated look is where the infotainment screen is the focal point of the interior, such as in the BMW i3 and the Tesla Model 3. Above: 2014 BMW i3. Below: 2018 Tesla Model 3 prototype interior. In both vehicles, the primary reason why the non-integrated design of the infotainment screen is suitable is the deferential nature of the rest of the interior. The Tesla Model 3 prototype, for example, not only lacks an instrument cluster for the driver, but its minimalist design hides any visible air vents and other physical buttons and switches. Consequently, the large infotainment screen becomes the only source of entertainment, information and control for the driver and passengers. As a result, the remainder of the interior is deferential to the infotainment screen, thus validating its tablet style placement in front of the dashboard such that it becomes the primary focus and can be optimally viewed by both the driver and passengers. The BMW i3 follows a similar principle. The air-vents, media and ventilation controls are functional, rather than fancy, in nature, and thus defer attention towards the infotainment system. In the specific case of the i3, a half length centre console means that there is no traditional division between the driver and passenger, and hence no 'tee' to the interior design. This enables BMW to instead place emphasis upon the horizontal plane of the interior in an effort to accentuate the width of the car. 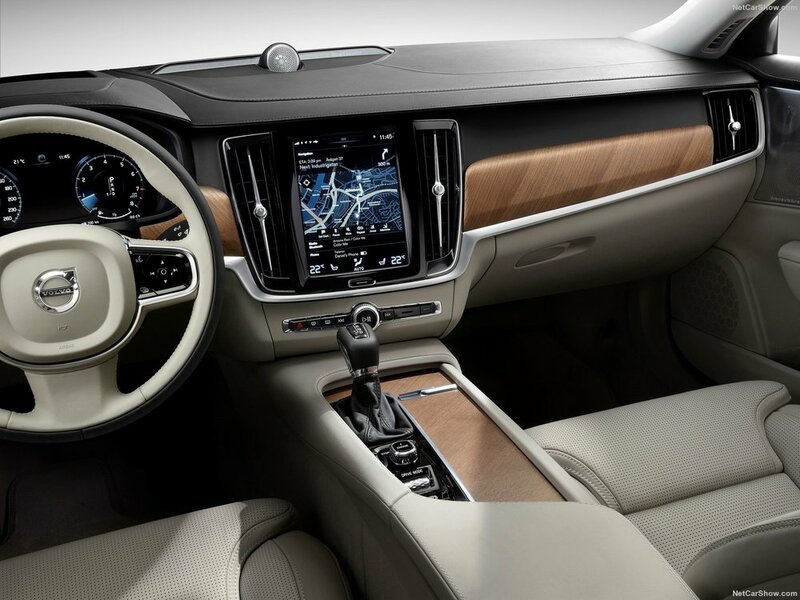 The 'floating' style placement of the infotainment screen, together with its widescreen display ratio, combines with the lengthwise orientation of the wood trim to further highlight the width of the dashboard. Fundamentally, automotive manufacturers should place the infotainment display such that it respects the intent and the inherent architecture of the interior. Where this architecture is a 'T' shape, the infotainment system as a rule of thumb should be located cleanly in either the dashboard (horizontal axis) or within the centre console (vertical axis), possibly by using a portrait orientation. In contrast, if the interior is deferential to the infotainment system, the display should generally be located at a focal point where it can be optimally viewed by all occupants of the vehicle.